Moon Neo MiND review | What Hi-Fi? True, its moniker evokes some Orwellian government brainwashing faction rather than a class-leading hi-fi component, but despite its rather eerily menacing acronym, the Moon Neo MiND is simply a really good streamer. It is worth noting that MiND actually stands for ‘MOON intelligent Network Device’. Effectively this means it does everything you’d expect from a streamer, drawing from all your mobile devices, NAS drives and streaming services via its control app to collate one whopping great music library. Physically, the MiND seems happy enough in its role, quite content just to blend in to your hi-fi rack. The black chassis is rather featureless, apart from a pair of logos, a trio of control buttons and LEDs to indicate input selection and sampling rates on its facing edge, and a modest vent on its top. There is considerably more to report round the back, with the headline being its lack of analogue output. So if you’re without a standalone DAC, or don’t have one built into your amplifier, you’ll have to factor that into your budget. We tested our MiND sample with a Chord 2Qute (£995). On a positive note, there are AES/EBU, SPDIF and optical digital outputs, so compatibility with any outboard DAC shouldn’t be a problem. Alongside these, through the back gate is also where you’ll find the power socket and switch, ethernet input, terminals for wi-fi and Bluetooth antennae and SimLink connections for use with other equally enabled Moon components. There’s also a one-size-fits-all remote in the box, which is useful for skipping tracks someone else has chosen when you’ve relinquished control of the iPad, but you’ll probably be doing most of your interaction with the MiND via its designated control app. This is usually where we insert a line about how the app looks nice, but keeps losing connection, or opts to play Alanis Morissette when we typed in Schubert. Thankfully, the MiND app is without such teething problems, but it is a bit clunky. Some functions, such as searching for artists on Tidal, take us through too many menus for it to be described as intuitive. We end up building a queue of songs, when all we want to do is press and play. If all this is beginning to sound a tad negative, rest assured the caveats end here. 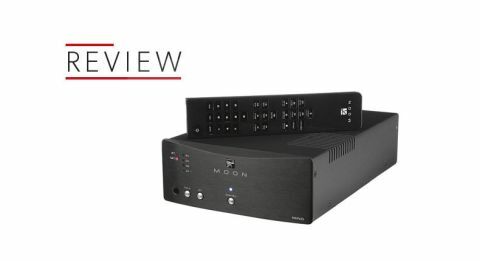 Because as soon as you start to listen to the MiND, you stop caring that playing your next song might take a fraction of a second longer than it should, and you start to appreciate why Moon omitted a DAC in order to focus on its digital performance. In simple terms, the MiND doesn’t sound like a typical streamer. It is almost entirely free of those telltale deficiencies in timing and dynamics, performing with a level of musicality we’ve heard rarely, if before at all, in this price bracket. We feed it Manchester Orchestra’s A Black Mile To The Surface, and get the texture of Andy Hull’s luscious, wavering vocal lines, set among harmonies painted with broad, bold strokes. The MiND renders voices with full body and detail, but more importantly with such a level of expression that songs’ characters are not lost even when playing over Bluetooth or via a compressed stream. The natural delivery of vocals catches our attention, but, as the album livens up in terms of instrumentation, the MiND swings open its doors and shows us the amount of space available, and just how much it is able to offer each instrument without losing composure or a sense of organisation. Fans of Moon’s signature sound will be pleased with the tuning here: there is no lack of punch, no sense the MiND is short of intensity, but it has that more laid-back temperament of many of its stable-mates. It’s nothing really to do with timing – it does that well – but it has a generally more relaxed character, siding toward a more human performance than the uptight and mechanical delivery of some competitors. Sonically, we can’t criticise the MiND: it is a balanced, elegant and all-round truly musical performer. You’ll need to factor in the cost of a suitable DAC if you haven’t already one elsewhere in the chain, which would really make this a £2700 streamer (if used with a Chord 2Qute) all told. But for a sound this natural coming from a streamer, it would still be a bargain if you have the funds.